Blackpool win 5-4 on penalties. Match ends, Blackpool 1(5), Mansfield Town 1(4). Penalty Shootout ends, Blackpool 1(5), Mansfield Town 1(4). Goal! Blackpool 1(5), Mansfield Town 1(4). Scott Quigley (Blackpool) converts the penalty with a right footed shot to the centre of the goal. Penalty saved! Jack Thomas (Mansfield Town) fails to capitalise on this great opportunity, right footed shot saved in the centre of the goal. Goal! 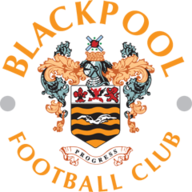 Blackpool 1(4), Mansfield Town 1(4). Jimmy Spencer (Mansfield Town) converts the penalty with a right footed shot to the bottom left corner. Goal! Blackpool 1(4), Mansfield Town 1(3). Kelvin Mellor (Blackpool) converts the penalty with a right footed shot to the high centre of the goal. Goal! Blackpool 1(3), Mansfield Town 1(3). Nathan Delfouneso (Blackpool) converts the penalty with a right footed shot to the bottom left corner. Penalty saved! Alfie Potter (Mansfield Town) fails to capitalise on this great opportunity, right footed shot saved in the bottom right corner. Goal! Blackpool 1(2), Mansfield Town 1(3). Omari Sterling-James (Mansfield Town) converts the penalty with a right footed shot to the top left corner. Penalty missed! Still Blackpool 1(2), Mansfield Town 1(2). Andy Taylor (Blackpool) hits the bar with a left footed shot. Goal! Blackpool 1(2), Mansfield Town 1(2). Callum Cooke (Blackpool) converts the penalty with a right footed shot to the bottom left corner. Goal! Blackpool 1(1), Mansfield Town 1(2). Malvind Benning (Mansfield Town) converts the penalty with a left footed shot to the top right corner. Goal! Blackpool 1(1), Mansfield Town 1(1). Paul Digby (Mansfield Town) converts the penalty with a right footed shot to the bottom left corner. Goal! Blackpool 1(1), Mansfield Town 1. Danny Philliskirk (Blackpool) converts the penalty with a right footed shot to the bottom left corner. Penalty Shootout begins Blackpool 1, Mansfield Town 1. Second Half ends, Blackpool 1, Mansfield Town 1. Attempt saved. Sessi D'Almeida (Blackpool) right footed shot from outside the box is saved in the centre of the goal. Corner, Mansfield Town. Conceded by Nick Anderton. Attempt blocked. Omari Sterling-James (Mansfield Town) right footed shot from outside the box is blocked. Nathan Delfouneso (Blackpool) is shown the yellow card for a bad foul. Omari Sterling-James (Mansfield Town) wins a free kick in the attacking half. Goal! Blackpool 1, Mansfield Town 1. Callum Butcher (Mansfield Town) header from the left side of the six yard box to the bottom left corner. Assisted by Malvind Benning with a cross. Paul Digby (Mansfield Town) wins a free kick on the right wing. Foul by Scott Quigley (Blackpool). Attempt blocked. Omari Sterling-James (Mansfield Town) left footed shot from the right side of the box is blocked. Sessi D'Almeida (Blackpool) wins a free kick in the defensive half. Attempt saved. Scott Quigley (Blackpool) left footed shot from a difficult angle on the left is saved in the centre of the goal. Corner, Blackpool. Conceded by Paul Digby. Substitution, Mansfield Town. Zayn Hakeem replaces David Mirfin because of an injury. Kelvin Mellor (Blackpool) is shown the yellow card for a bad foul. David Mirfin (Mansfield Town) wins a free kick in the attacking half. Attempt missed. Omari Sterling-James (Mansfield Town) right footed shot from outside the box is close, but misses to the left. Attempt missed. Kelvin Mellor (Blackpool) header from the centre of the box misses to the right. Corner, Blackpool. Conceded by David Mirfin. Substitution, Mansfield Town. Jack Thomas replaces Will Atkinson. Substitution, Blackpool. Nathan Delfouneso replaces Max Clayton. Attempt missed. Sessi D'Almeida (Blackpool) right footed shot from more than 35 yards misses to the left. Substitution, Mansfield Town. Omari Sterling-James replaces Lee Angol. Will Aimson (Blackpool) wins a free kick on the left wing. Alfie Potter (Mansfield Town) wins a free kick in the attacking half. Attempt saved. Scott Quigley (Blackpool) right footed shot from outside the box is saved in the centre of the goal. Will Aimson (Blackpool) wins a free kick in the defensive half. Foul by Sessi D'Almeida (Blackpool). Foul by Nick Anderton (Blackpool). Jimmy Spencer (Mansfield Town) wins a free kick in the defensive half. Corner, Mansfield Town. Conceded by Andy Taylor. Krystian Pearce (Mansfield Town) hits the right post with a header from the centre of the box. Foul by Max Clayton (Blackpool). Jimmy Spencer (Mansfield Town) wins a free kick in the attacking half. Attempt missed. Scott Quigley (Blackpool) right footed shot from outside the box is close, but misses to the right. Paul Digby (Mansfield Town) wins a free kick in the defensive half. Attempt missed. Armand Gnanduillet (Blackpool) right footed shot from outside the box is close, but misses to the left. Attempt missed. Callum Butcher (Mansfield Town) right footed shot from outside the box is close, but misses to the left. Substitution, Blackpool. Will Aimson replaces Clark Robertson. Second Half begins Blackpool 1, Mansfield Town 0. First Half ends, Blackpool 1, Mansfield Town 0. Kelvin Mellor (Blackpool) wins a free kick in the attacking half. Paul Digby (Mansfield Town) wins a free kick on the left wing. Corner, Blackpool. Conceded by Bobby Olejnik. Attempt saved. Armand Gnanduillet (Blackpool) right footed shot from the left side of the box is saved in the bottom left corner. Attempt missed. Kelvin Mellor (Blackpool) right footed shot from very close range misses to the right following a set piece situation. Sessi D'Almeida (Blackpool) wins a free kick on the left wing. Foul by Paul Digby (Mansfield Town). Attempt missed. Malvind Benning (Mansfield Town) left footed shot from the left side of the box is close, but misses to the left. Attempt missed. David Mirfin (Mansfield Town) header from the centre of the box is just a bit too high following a corner. Lee Angol (Mansfield Town) wins a free kick on the left wing. Goal! Blackpool 1, Mansfield Town 0. Kelvin Mellor (Blackpool) header from the centre of the box to the top right corner. Assisted by Andy Taylor with a cross. Corner, Blackpool. Conceded by Krystian Pearce. Danny Philliskirk (Blackpool) hits the bar with a right footed shot from the right side of the six yard box. Foul by Alfie Potter (Mansfield Town). Nick Anderton (Blackpool) wins a free kick in the attacking half. Attempt saved. 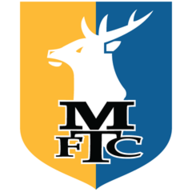 Jacob Mellis (Mansfield Town) right footed shot from the right side of the box is saved in the centre of the goal. Attempt missed. Callum Cooke (Blackpool) right footed shot from outside the box is high and wide to the right. Attempt blocked. Armand Gnanduillet (Blackpool) right footed shot from outside the box is blocked. Hand ball by Sessi D'Almeida (Blackpool). David Mirfin (Mansfield Town) wins a free kick on the right wing. Attempt missed. Alfie Potter (Mansfield Town) right footed shot from the right side of the box is close, but misses to the right. Attempt missed. Sessi D'Almeida (Blackpool) left footed shot from outside the box is close, but misses to the left.